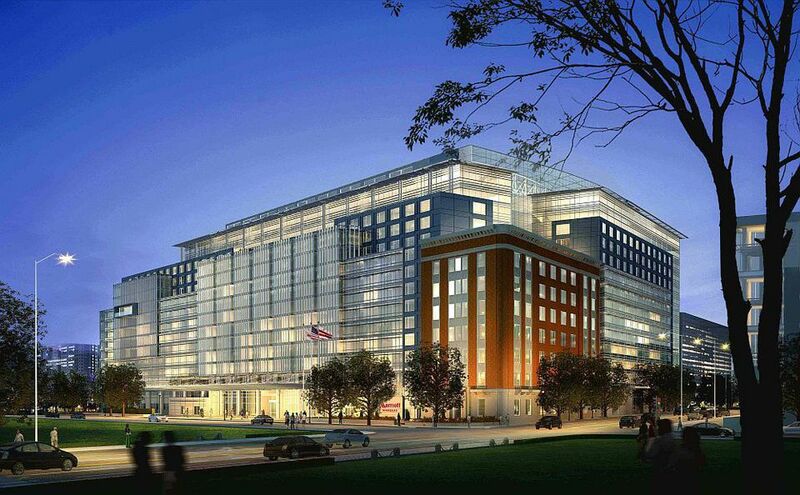 The Marriott Marquis Washington, DC, the Washington Convention Center headquarters hotel, opened on May 1, 2014. The 1,175-room hotel has 100,000 square feet of meeting and assembly space, including a 30,000 square foot grand ballroom, and five separate, publicly accessible retail and restaurant outlets on the ground floor. Located across the street from the Washington Convention Center, the hotel is one of only five Marriott Marquis properties in the country. It is the largest hotel in Washington DC and serves as the centerpiece of continued economic revitalization of the historic Shaw neighborhood. The Marriott Marquis features varied dining experiences that feature fresh, seasonal menus sourced from both local and Mid-Atlantic purveyors as well as the hotel’s on-site rooftop garden. Anthem: casual dining restaurant offering seasonal cuisine with a nod to the original 1927 Marriott Hot Shoppes (from the Mighty Mo burger to the nine-seat, throwback coffee shop countertop). The diner-inspired menu will include comfort food and Marriott Hotels’ signature healthy-eating options, including good-for-you kid’s menu options. The Dignitary: an upscale lounge with a speakeasy feel, rich with dark woods, a red brick bar, an antique cash register, red leather club chairs, a simmering fireplace, and polished tin ceiling tiles. The menu will feature sophisticated small plates. The Dignitary is located within the site’s original Samuel Gompers AFL-CIO headquarters, known as the "Plumbers Building,” which will also house the hotel’s 8,000-square-foot bi-level fitness center and several suites. An outdoor patio offers a variety of high-top, lounge, and couch seating, a sunny whiskey-laden cocktail menu, light small plates, and live music Thursday and Friday evenings. .
High Velocity: the high-tech sports bar boasts 36 large flat-screen TVs, smartphone charging stations, Wi-Fi, tickertape screens with the latest sports scores, a central focal-point bar, communal dining, and floor-to-ceiling windows to enjoy street-level views of the Washington Convention Center (which Marquis will be connected to via underground concourse). The menu will include 48 brews on tap as well as beer-infused dishes. Lobby Bar: Guests can enjoy a quick bite and a coffee, or tapas plates and a cocktail underneath the hotel’s centerpiece: a 56-foot sculpture, “The Birth of the American Flag.” The expansive, design-rich lobby will also feature two smaller-scale sculptures, two dramatic bronze and stainless steel walls at more than 50 feet in height, and water features. The hotel employs a diverse group of hosts, who represent many countries and collectively speak over 30 languages. Job opportunities may be available in housekeeping and front office, culinary, restaurants, engineering, loss prevention, and more. Applications are accepted online. Since the company's founding in 1927, Marriott International is recognized as a leading employer in Washington, DC, creating opportunities for more than 15,000 people in the area and serving the local community for more than 85 years. The Marriott Marquis Washington DC was designed to earn LEED Silver (Leadership in Energy and Environmental Design) certification, registered by the U.S. Green Building Council (USGBC). The hotel will be one of the largest hotels in the country to earn Silver certification, verifying that a the building was designed and built using strategies aimed at improving performance in energy savings, water efficiency, CO2 emissions reduction, improved indoor environmental quality, and stewardship of resources and sensitivity to their impacts. A development team led by Quadrangle Development Corporation has received a 99-year lease to build the hotel on city-owned land. With a portfolio of more than 80 properties, Quadrangle is a leading vertically-integrated commercial real estate firm in Washington metropolitan region. The firm employs a highly analytical, market-focused approach to develop, acquire, and operate best-in-class commercial and residential properties in Washington, DC, Maryland, and Virginia. Marriott International, Inc. is a leading lodging company with more than 3,800 properties in 74 countries and territories. The company is headquartered in Bethesda, Maryland and has more than 325,000 employees worldwide. Marriott leads the industry with innovations that elevates style, design and technology. For more information on Marriott and its properties around the region.